If you are anything like me, you would have impulsively bought a few balls of novelty yarn in the hope that one day you will find the perfect project for them. Before you know it, the novelty yarns are lost and forgotten in the stash for a few years. 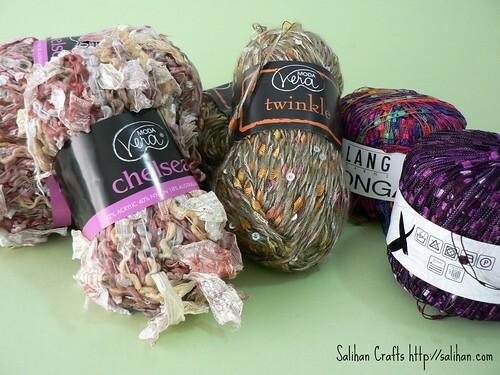 I’ve searched Ravelry several times trying to find the right project for these yarns. 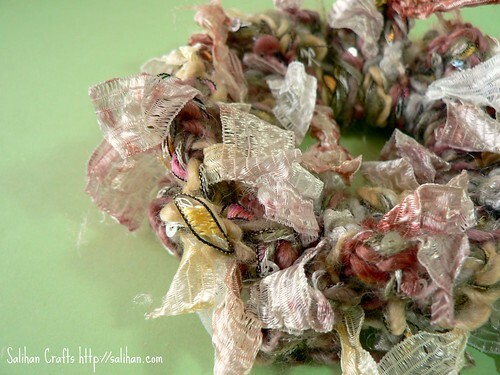 There’s a lot of novelty yarn scarves out there! Not my cup of tea though. But I am excited to tell you that I’ve found the perfect project! I’ve recently discovered Craft Passion. 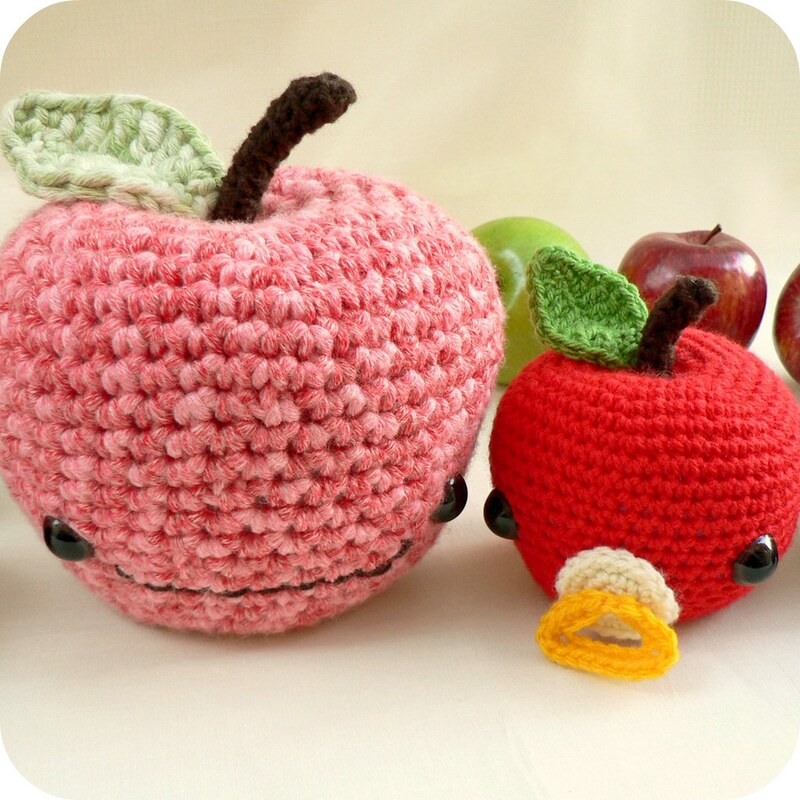 She has several good tutorials and free patterns on her site that’s definitely worth checking out. 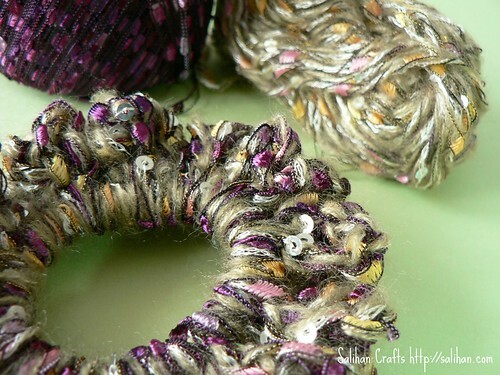 The one that made me extra excited was her Crochet Hairbands (pattern). All you need are your novelty yarns, hair ties and crochet hooks. 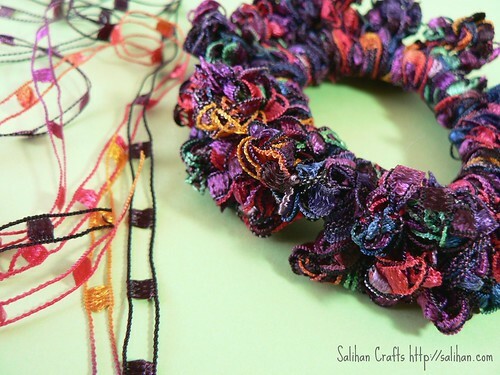 If you can chain and double crochet, you can make this! I experimented with different yarns together and used different sized crochet hooks for each combination. I love them! They’re just so pretty and boy, were they quick to crochet! Are your brains ticking over yet? Mine has! These will make great last minute gifts for colleagues and teachers, stocking stuffers, gifts for new mums and the party hostess, party favours for birthday girls… Oh, the possibilities! Pretty! I bet you could sell them too. I have a few novelty skeins from Spotlight too… may have to give this some consideration. 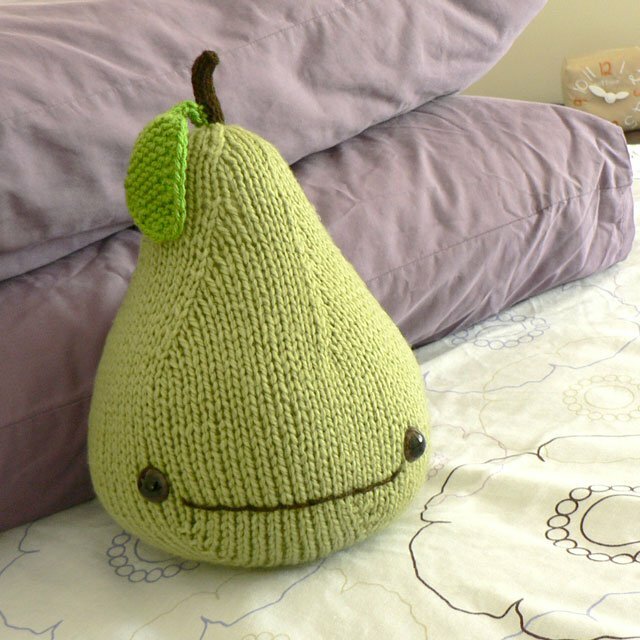 ps love that photo in your sidebar of the little girl with all your pears – adorable! These are really pretty ~ now if only I had enough hair to use them with…. Thanks for sharing…I’m going to pass this on to a friend. Haha wow they look great! 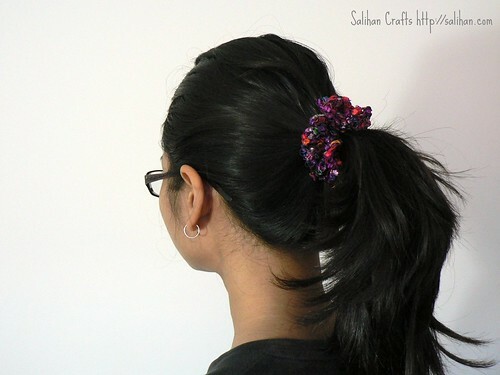 It’s been ages since I’ve worn a scrunchie – that’s what they remind me of. Too cute! and what a good excuse to buy those lovely yarns!!! ow! 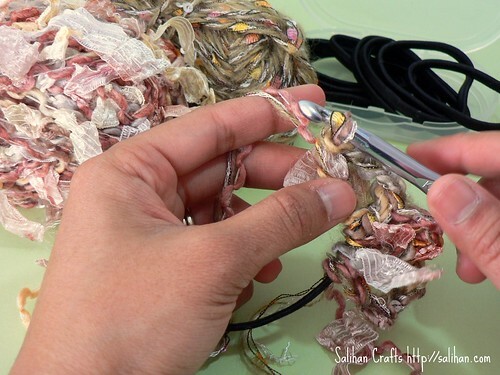 and thanks for the great link to craft passion, she sure has great tutorials!!! 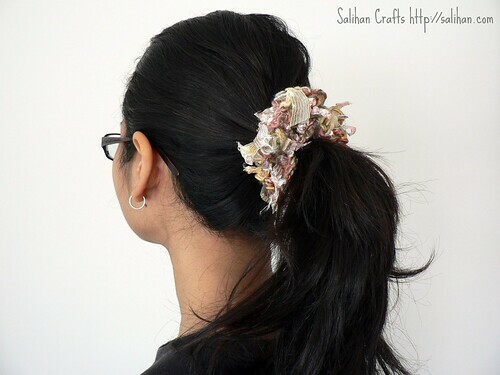 I put a link of this post in my blog, as an update in my hairband post. 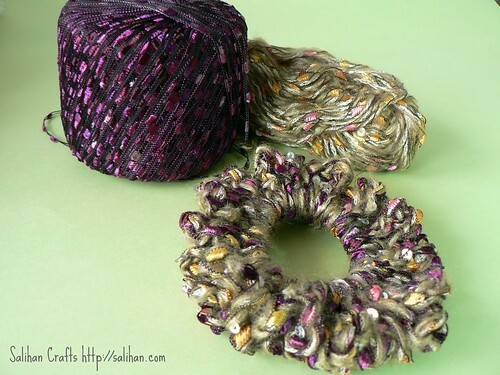 I am sure my readers will love to see how you make it with the stylish novelty yarns! So pretty, my daughter would like these. I am going over to look at the pattern to see if a beginner like me could do it. wow salihan you are soo inspiring! I definitely have some novelty yarns lurking somewhere in the closet. Those cute hair ties definitely look like my cuppa tea! That’s a fantastic use for novelty yarn!! I never know what to do with it. Great job!! Okay these are awesome! They remind me of the scrunchies of my childhood. I have a few skeins of ribbon yarn too. Last year I ended up making a scarf with it, but I had held a strand of Patons Classic Wool Merino with it to offset the novelty-ness. Thanks for the project idea, now I can finish off those other skeins. Why oh why do we buy novelty yarns? This is great! 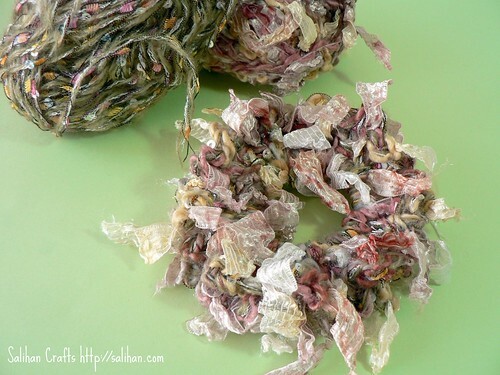 I have very long hair and prefer to use this time of hair wrap because its less damaging. Also, a few months back, I bought tons of novelty yarn at a local shop that was having a great sale ($1.19 per skein!). This will be a great use for some of it. Thanks for posting the info. Love them. I should be studying today but I can see I will have to make a few of these first!! Thanks for the inspiration – I know what everyone will be getting for christmas! What a great idea. Super cute! 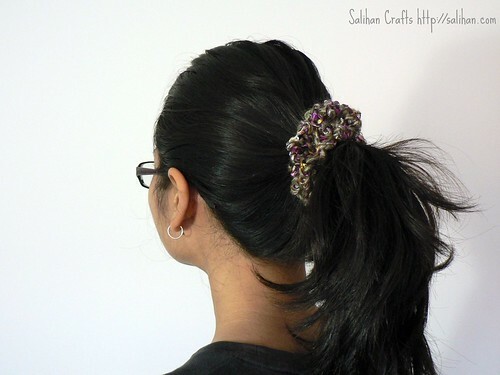 I wish my hair was long enough for me to have the need to make some of these. 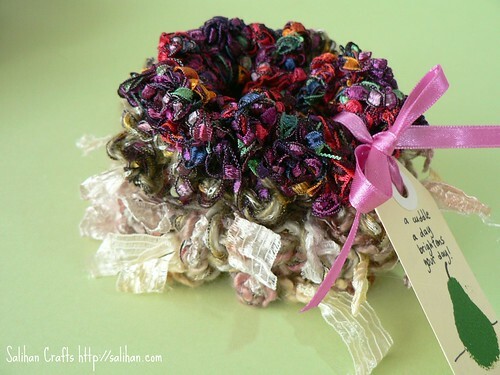 This is one of the best ideas I’ve seen for using novelty yarns. Are these hard to tie on? .-= Tiffany´s last blog ..New Parfum err Toilette Spray =-. Han, I love the scrunchies, they’re beautiful. Next, jangan lupa buat kueh mueh and cake baking and planning for your Hari Raya Idil Fitri. Last year you had a good time kan having your friends over. You ada plan apa apa tak tahun ini? Last week I had such a craving for red coloured rose flavoured jelly and I made it. And I enjoyed eating it all by myself. Suami tak suka jelly. So lucky lah, no need to share. Hi Sandra! It’s wonderful to hear from you again! It’s been such a long time. I’m not sure how my Eid celebrations will be this year. Quiet I suspect. Thanks for remembering and the encouragments. 🙂 Take care ok! 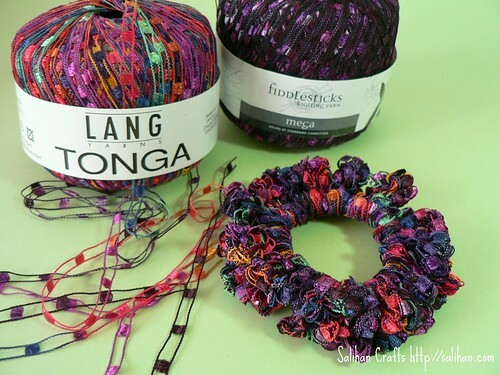 What a great idea for funky yarn! I know a little girl who would LOVE one of these! .-= Kimberly Pye´s last blog ..We’re gonna crack open the bigeg! =-. Great idea! I love thinking of ways to use up yarn. I guess I’m a minimalist at heart.